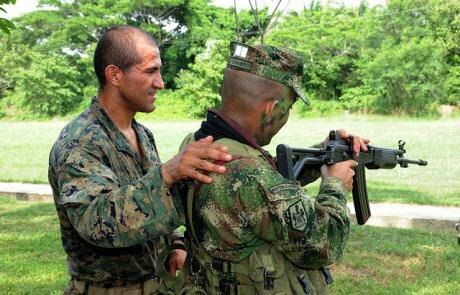 A US marine coaches his Colombian counterpart during a joint training exercise. Flickr/Naval Surface Warriors. Some rights reserved. The Colombian war may soon reach an end as the peace talks between the government and the FARC advance at a slow but continuous pace. This can only be good news for a country involved in a decades-old internal conflict. It happens at a time when the Colombian military has reached unprecedented size and capability after more than a decade build-up. Currently they are the largest army in Latin America; external demand for their know-how is on the rise, and they are a privileged US partner in a range of external missions from direct intervention to advising and capacity building. US financial and military support has been critical to achieve this. To some extent, it has replicated its own model of security policies and armed forces, including high levels of immunity and limited oversight. But now, inevitably, questions arise about the past and future of that relationship, and what it means in terms of the role of the military in the Colombian post-conflict scenario. The Colombian historical pattern of civil-military relations has been different than in other Latin American countries. The only coup took place in 1953 and the military remained in power until 1958. The civil-military non-formal ‘pact’ achieved then (and respected thereafter) included armed forces refraining from interference in civilian affairs, while governments would support military primacy and decision-making related to defence and security matters. One practical consequence of the agreement was a lack of civilian oversight and guidance. This is of huge importance in a country characterized by state weakness. For most of Colombian history, central governments have shown a profound inability to project state power and establish political authority throughout the country. The state has been absent or extremely weak in huge portions of regions, particularly in rural areas. This historical failure provided insurgent groups with an opportunity for consolidation, and ideal environments for the illegal drug economy to flourish. These factors, added to the pattern of civil-military relations, combined to keep the military small and weak for Latin American standards in the 20th century. Defence and military spending was very low. As a result, until the ‘90s, the military approach to counter insurgency was defensive and based in containment. The army had defensive brigades and battalions but lacked the mobility and operational capabilities to effectively deal with counter insurgency. The situation allowed rebel forces (particularly the FARC) to wage a decades-long struggle against the government, and set the stages for the emergence of a variety of self-defence and paramilitary groups and others related with the illegal drug trade, all forces multiplying and complicating violence. In the '90s the combined threats of state weakness, illicit drug production and trafficking and growing non-state armed groups had heavily affected security policy. By the end of the decade the FARC reached the height of their power, expanding across the country and launching major offensives against government forces. The de facto state reliance on paramilitary groups to deal with guerrilla groups and launch counter insurgency campaigns also reached its peak with the nation-wide expansion of the mostly demobilized paramilitary group, the United Self-Defense Forces of Colombia (Autodefensas Unidas de Colombia, AUC). By then Colombia had become a prominent example of a problematic international agenda with multiple intertwined threats: state fragility, insurgency and drug trade (and, after 9/11, terrorism). A failed peace process with the FARC and a combination of internal and external conditions gave rise to Plan Colombia. While Colombia had been critical in the US National Security Strategy during the Cold War and subject to a degree of covert interventionism through investment and training, this program marked the closest relationship between both countries. Plan Colombia was a $7 billion package of financial aid towards Colombia over less than a decade to mount a counter narcotics and counter insurgency campaign. Three-quarters were assistance for the military and the police. In 2002 the US Congress authorized the use of counter narcotic funds to fight terrorism and in 2003, President Alvaro Uribe launched Plan Patriota: Rather than responding to illegal armed group’s initiatives, this ambitious plan expanded the size and strength of the army and police to adopt a harder and proactive approach. US support has made Colombia the largest non-Middle Eastern recipient of military aid and the third in the world (after Israel and Egypt). US support made key differences in funding, training, maintaining and managing substantial increases in capabilities for air mobility, intelligence, communications, coordination and organizational capacity. Air mobility is crucial given the size and inaccessibility of much of the Colombian territory. The helicopter force available soared, an effort supplemented by the creation of effective (vetted and trained) units such as the Army Aviation Brigade, the Army Counter Narcotics Brigade and new mobile units in both the army and police. Those initiatives marked a shift to an unconditional support for the military force build-up, although President Uribe also put in place unprecedented levels of control over operations. Defence spending (funded, in part, through a special tax over elite assets) tripled from $4 to $12 billion. In 2000 the armed forces had 145,000 members while in 2008 they were 236,000. By the middle of the decade the US had supported operations in several departments and thousands of Colombian soldiers had been deployed. But while the operations could chase the FARC out of an area, they could not prevent them from returning once the offensive ended. There was no strategy in place to hold and consolidate gains. The solution came in the form of a number of policies and programs, financed with national and US funds: The aforementioned Plan Patriota, the Democratic Security Policy and later Integrated Action, a strategy elaborated by US Southern Command (USSOUTHCOM) and the Colombian Ministry of Defence. The underlying doctrine was that historically neglected rural areas could only be taken back through a whole government approach to recover and consolidate state presence. The result was a sequenced and phased strategy based in military operations, quick social and economic efforts (designed to win ‘hearts and minds’), and the establishment of a functioning civilian government. In other words, territorial control, stabilization and consolidation. But despite the rhetoric, Integrated Action was a mostly military mission and in 2009 Colombia launched the Strategic Development Initiative (CSDI) to support this effort and the Consolidation Model by providing economic opportunities once security and basic public services had been established. An example of the US doctrine of ‘stabilization’, it managed to attract important funding from Washington, with resources provided under Section 1207 Security and Stabilization Assistance (funds transferred from Defence to the Department of State). The Colombian integration of stability operations into military doctrine reflects and accompanies the same trends in the US military. Washington has been seeking models to reduce the burden on US forces amid budgetary restraints, while helping foreign partners to address complex security challenges that go well beyond the military operations. A prominent example in the western hemisphere is SOUTHCOMM, whose role is not limited to military advice or joint exercises but includes humanitarian missions (including natural disasters) and fight against drug trafficking. Currently a Joint Interagency Security Command, it integrates civilian agencies and makes inroads in poverty, exclusion and corruption, increasingly placing civilian issues under a military umbrella. In this stabilization model, military agencies take a leading role in operations that may include military, development, humanitarian, governance and rule of law components. Under budgetary restraints, the US has found in Colombia a reliable partner. On one hand, it has helped to create a mirror both in Colombian armed forces and security policies. On the other, it is increasingly relying on Colombia for external operations to be conducted with US funds but under less control and at lower cost. The results of those efforts for Colombia have been evident, and mixed. On the positive side, the paramilitaries entered a demobilization process while a number of successful operations managed to weaken the FARC. Military offensives and successful counter insurgency tactics set back their territorial presence, coordination capacities and ability to mount major attacks, moving the conflict to borders and stateless rural areas. Some indicators of citizen security (including killings and kidnappings) improved. The negative side is the human rights cost, which is unbearably high in terms of people killed, forcibly displaced and disappeared. Forced drug eradication and aerial spraying caused further displacement of vulnerable populations, environmental and social damage, and the dispersion of crops to new territories and departments. Obsession with ‘results’ provided segments of the military with perverse incentives (being the ‘false positives’ scandal the gravest among them). Civilian oversight remains extremely limited. A 1997 Constitutional Court decision placing the investigation of human rights violations by the military under civilian courts was reversed by Congress in 2011. In 2013 the Constitutional Court again rejected that agreement and though final status of the issue is not yet solved, there is a mounting pressure to avoid civilian jurisdiction. President Juan Manuel Santos is conducting the peace dialogue with the FARC with maximum respect to the military and trying to secure their support (or at a minimum, non-interference) in the process. Military reform and the security policy are not included in the agenda of negotiations. All of this is within the bounds of the high level of privileges they enjoy as an institution: coordination and control of the defence system by the military themselves; high levels of autonomy in the administration of resources and income; high immunity and absence of legislative oversight over military matters, among others. But Colombia has managed to sell a history of successes. A military that pioneered the doctrinal and technical development of counter insurgency operations in Latin America (alongside with Mexico) has found new roles in stabilization and state building. Now the combined size of armed forces is 500,000 (including the police). In 2012 the defence budget stood at $12 billion. The fact that Colombia has been maintained as a key hub for US security policies has strong implications. After Iraq, Afghanistan and the financial crisis, the US prefers special operations that leave a “light footprint”. It aims to teach other countries to fight threats for their security and work in networks with other special forces to fight transnational networks (organize crime, terrorism and beyond). Colombia plays a key role both in symbolic and real terms. First, it has been an emblematic case of US involvement in terms of the duration of support, amount of funds and diversity of state building tasks carried out. Second, Colombia is already playing an important role in executing US security assistance programs in Central America, the Caribbean and West Africa. The US is relying on Colombia for a growing range of operations, including direct assistance to African countries and help AFRICOM with peacekeeping and other efforts, and they jointly engage in direct operational support and indirect capacity building efforts. Both countries recently signed an Action Plan on Regional Security Cooperation that seeks to coordinate aid to third countries while deepening partnership in continued counter narcotics operations. The use of third parties allows the US to avoid the financial and political risks associated with direct involvement, through a cost effective strategy that allows for training missions to continue. Likewise, the model of stabilization operations developed and executed in Colombia are now promoted throughout the continent and in Africa. The Colombian military is using its knowledge and experience in battle missions for the combat of guerrillas, paramilitaries, urban gangs and traffickers to train security personnel throughout Latin America and beyond. It is a regional training base for counter narcotics efforts. Between 2010 and 2012, military and police trained 9,200 personnel from 45 countries. The size and capabilities of the Colombian military; their experience with a variety of missions including state building, and this new demand for their skills and knowledge add a new dimension to the challenges of a post conflict scenario. In any transition scenario, two issues would be important: accountability for past human rights abuses, and the adjustment of doctrines, size and budget (most likely under a ‘security sector reform’ program). But the close relationship between US and Colombian militaries and new international engagement may provide a perfect argument to justify increased military budgets to respond to internal and external threats. Colombia’s role as a key US partner may further undermine any attempt of civilian control and strengthen their disdain for civil society and allegations of human rights groups and international organizations. Recent news at the beginning of February 2014 confirmed opposition to the peace talks is backed by the powerful military. A secret unit within the intelligence branch of the Armed Forces has been secretly monitoring communications of the main partners in the Havana talks, notably including the chief government negotiator and the High Commissioner for Peace. President Santos reacted harshly and two generals were dismissed. An investigation is starting. Under what orders were they operating? Who received the information and with what purposes? There are two main ‘suspects’: sectors of the Armed Forces and/or sectors of the Colombian establishment. It remains to be seen whether this is an attempt to boycott the dialogues or just another example of problematic civil-military relations.